Members of the Islamic Movement in Nigeria (IMN) clashed with the police at the National Assembly Complex on Monday. They had arrived at the entrance of the national assembly around midday but were prevented from gaining access to the premises. The security operatives fired shots into the air while dispersing them. Tear gas was also used against them as they were chased out of the premises while some of them were subsequently arrested. Attempts to confirm the number of arrests was unsuccessful as the Abuja police command could not be reached as of press time. The protesters were demanding the release of Ibrahim El-Zakzaky, their leader, who has been in custody of security agencies since 2015. The Abuja incident happened one day after a member of the IMN was killed in Kaduna. Shi’ites had staged a protest along the Ahmadu Bello way, seeking their leader’s release. Trouble started when policemen arrived the area and started shooting in the air to disperse the protesters. Ibrahim Musa, spokesman of the Islamic group, said confirmed the killing of one person, adding that several others were wounded. But the police, in a swift reaction said no life was lost. 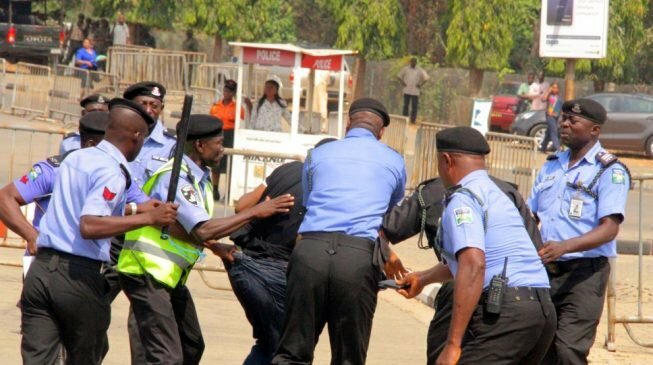 Mukhtar Aliyu, spokesman of the Kaduna state police command said the police officers were deployed to disperse the procession as the state government had banned such processions.